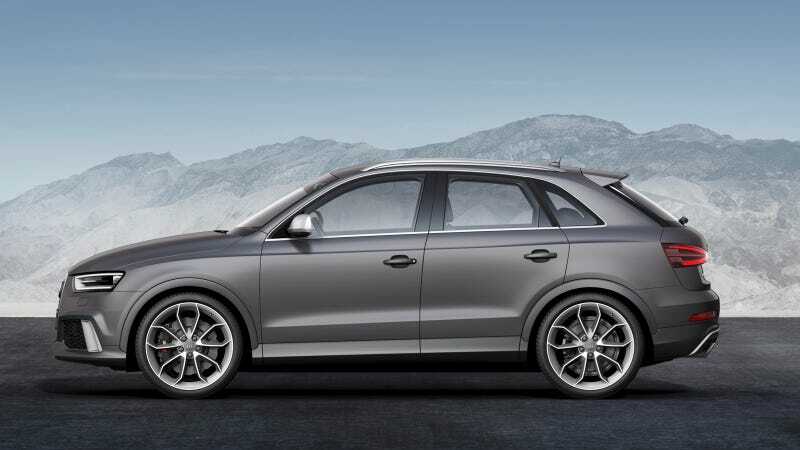 Elsewhere on the planet, there's something called the Audi Q3. It's sort of like if you under-inflated a Q5, probably. With crossovers of any size apparently being the rage in the U.S., you'd think Audi would send its littlest Q-ute over right away. Don't worry, it's coming. They just need to make it more of a truck first. Car and Driver published a short piece over the weekend covering the press launch for the RS version of the Q3 (powered by the turbocharged straight-five out of the TT RS) and said the car's hang-up in the American market is the fact it doesn't meet the requirements to be considered a light truck, including "the mandated approach angle for such vehicles." (3) Available with special features enabling off-street or off-highway operation and use. The Q3 seats five. It's an Audi, so it offers a Quattro system. It looks like an SUV, so it's probably meant to transport things. But not bales of hay or farm machinery as this law was probably intended for. I think someone giving a piggy-back ride and carrying a grocery bag could almost be considered a light truck by this definition. Audi will soon figure out how to lessen the frontal area of the Q3, or something like that, and it and the hot RS Q3 will show up at a showroom near you.